Crosby vs Ovechkin: Who Influences Their Team More? It has been an unorthodox start to the Ice Hockey season this year as the World Cup returned after a 12-year break. As we mentioned in our previous article on specific ice hockey players, the World Cup and the Olympics are the only two international tournaments where the best players across all leagues meet in one competition. Unfortunately, it seems like the format of the tournament put a spanner in the works – interest dropped significantly when Team Europe qualified for the final against Canada. In fact, the final game wasn’t even sold out! Luckily, for every thirsty Ice Hockey fan, the NHL season is under way with the best players ready to rumble (albeit at a club level). Two of the most renowned stars in the NHL - Sidney Crosby and Alexander Ovechkin - have had a fair amount of attention since they first came head-to-head in 2005/06, with fans and critics comparing their performances. This year is no exception, and we immediately shine a spotlight on the comparison by the fact that the Washington Capitals (Ovechkin’s team) and Pittsburgh Penguins (Crosby’s team) are playing each other in the opening game of the season. But what can we expect from these two Ice Hockey giants? Who seems most likely to shoot off the block and perform well this year? And who can perform best under pressure and lead their team all the way? 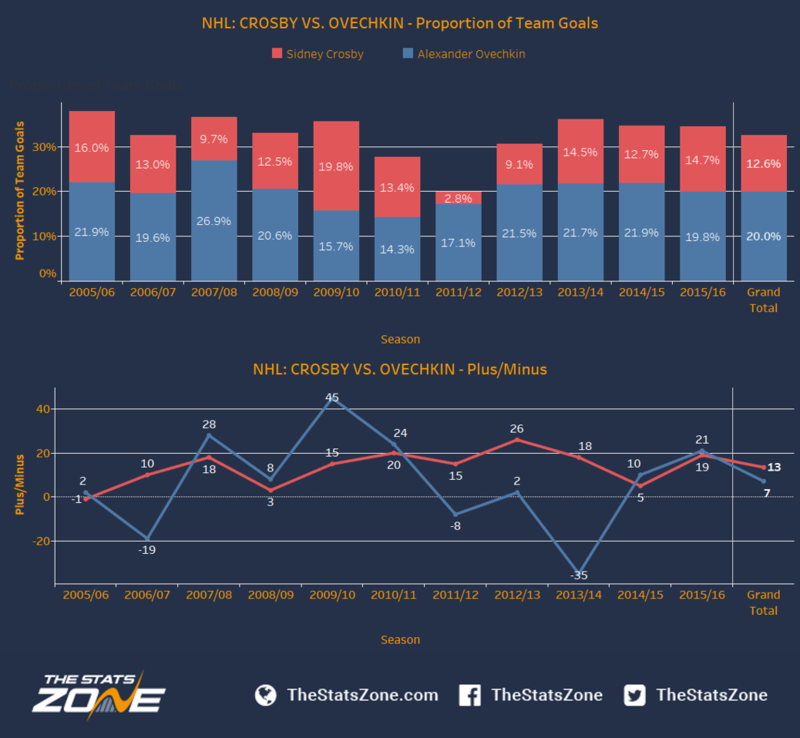 TSZ has decided to analyse NHL data in a bid to determine who comes out top between Crosby and Ovechkin. Do the pair boast different skill sets and affect their team performance in different ways? Or is the distinction clearer than that, where one player outperforms the other year in and year out? Only the stats can tell so let’s get started! There were a few considerations in this study. Firstly, we have decided to predominantly look at the players’ performance during all regular season games in NHL between 2005/06 and 2015/16. In the rare instance that we look at performance in the playoffs, it is clearly marked and pointed out in the text. In the study we will refer to plus/minus which essentially means the number of goals scored minus the number of goals conceded when the player is on the ice (powerplay and boxplay excluded). The last part of the analysis looks at number of achievements per player; this takes into consideration performance on club and international level. In this part we refer to Hart Memorial Trophy which is awarded each season to the player that has performed best during the regular season. To get into the analysis, we will start by looking at goals and assists per game. This is visualised in two separate line graphs showing performance per season with a grand total (average) to the far right of each graph. This gives us an indication of each players’ style and where they have most impact on the ice. The third graph illustrates the proportion of goals vs. team totals. This helps demonstrate each players’ performance in relation to the number of goals their respective teams score. The fourth graph (line graph) demonstrates the plus/minus statistics giving an idea of each season’s surplus/deficit. The next three visualisations follow the same structure and are illustrated through double bar graphs. In the first of these double bar graphs we are looking at proportion of shots scored (blue bar) and number of shots per game (red bar). The second looks at proportion of powerplay (blue) and game winning (red bar) goals. The third looks at the average goals (blue bar) and assists per game in the playoffs to see who has performed best in the most crucial part of the season. The final graph summarises each player’s career achievements on international and club (NHL) level in a simple bar graph to investigate who has had the most influential career. Looking at the top graph below we can see that Ovechkin (blue line) scored more goals per game than Crosby in all seasons but 2010/11 at 0.78, compared to Ovechkin at 0.41 – a season in which Ovechkin’s goals per game ratio was well below his average of 0.63. When comparing both players’ average goals per game, we can see that the Ovechkin scores 0.15 more goals per game, confirming that he is shaper in front of the net than Crosby. Moving on to the lower graph showing assists per game we can see the opposite trend. Crosby demonstrates a higher assist per game in every season but 2009/10, where he managed to get an average of 0.72 compared to Ovechkin at 0.82. This season is the best in the dataset for Ovechkin, suggesting that this performance is above the norm. Looking at the 2011/12 season for Crosby, we can see an impressive 1.32 assists per game which is almost one assist more per game than Ovechkin at 0.35. The grand total average also shows Crosby’s dominance in this field, with a 0.32 (0.85-0.53) higher assist per game average than Ovechkin. Therefore, from these two graphs it seems that Crosby and Ovechkin impact at different levels of the game, with the former assisting his team mates and the latter scoring the goals. The graph below looks at proportion of total team goals and plus/minus performance. In the top graph we can see that Ovechkin dominates the proportion of goals scored. He has scored more goals in all seasons but 2009/10, where he “only” scored 15.7% of team goals compared to Crosby’s 19.8%. The most impressive season for Ovechkin came early in his NHL career when he scored 26.9% of his team’s total goals in 2007/08. Looking at the grand total average we can see that Ovechkin sits 7.4% above Crosby at 20.0% of all goals scored compared to 12.6%. Moving on to the lower graph showing plus/minus stats we can see that Crosby has a more stable line than Ovechkin’s which is more noisy. Furthermore, it shows that Crosby hasn’t had a single season in which he ended with a negative plus/minus statistic. In comparison, Ovechkin has on three occasions: 2006/07 (-19), 2011/12 (-8) and 2013/14 (-35). When looking at the grand total level we can see that Crosby is five goals above Ovechkin per season. 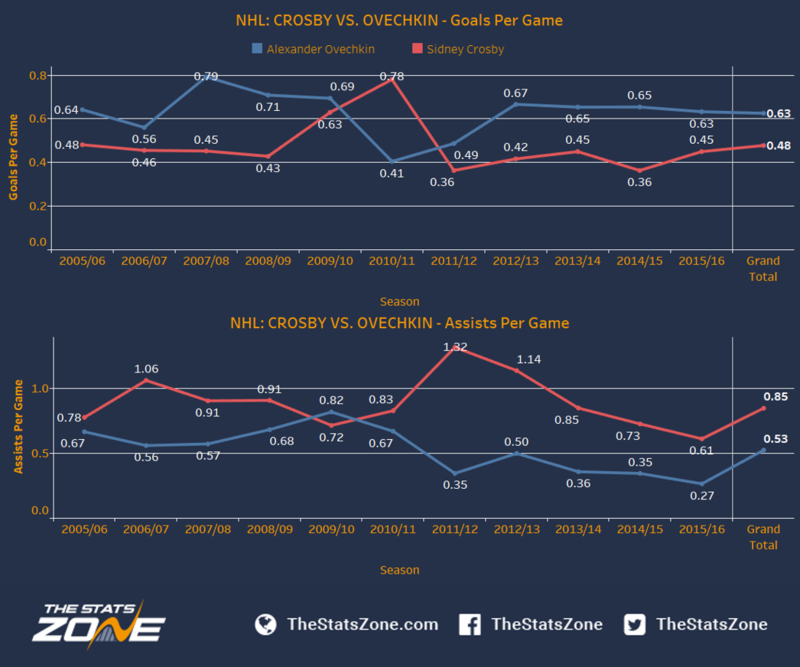 The final take out of these two graphs is that Ovechkin seems more orientated towards an attacking style of play than Crosby, scoring a higher proportion of his teams goals but at the expense of a worse defensive performance (negative plus/minus statistics in some seasons). The top graph below shows the proportion of shots scored (blue bar) and number of shots per game (red bar). In this graph we can see that Crosby scores 14.2% of his shots taken compared to Ovechkin at 12.5%. However, when looking at the shots per game there is a clear difference with Ovechkin’s average at 1.7 (5.0-3.3) higher than Crosby. In theory, having more shots should lead to a higher goal production, and this corresponds with the take outs from our two previous graphs. Furthermore, with more shots taken it would be harder to keep up a high proportion of shots scored, bringing down the shots scoring percentage as we can see with Ovechkin. Moving on to the lower graph illustrating proportion of powerplay (blue) and game winning (red) goals. Looking at the blue bar we can see that Ovechkin scores 37.1% of all of his goals in powerplay compared to Crosby at 29.9%. Since Ovechkin scores more than Crosby on average we can also confirm that a higher proportion of these goals come when his team is playing powerplay. Looking at the proportion of game winning goals we can yet again see that Ovechkin outperforms Crosby, with 16.8% compared to 13.6%. 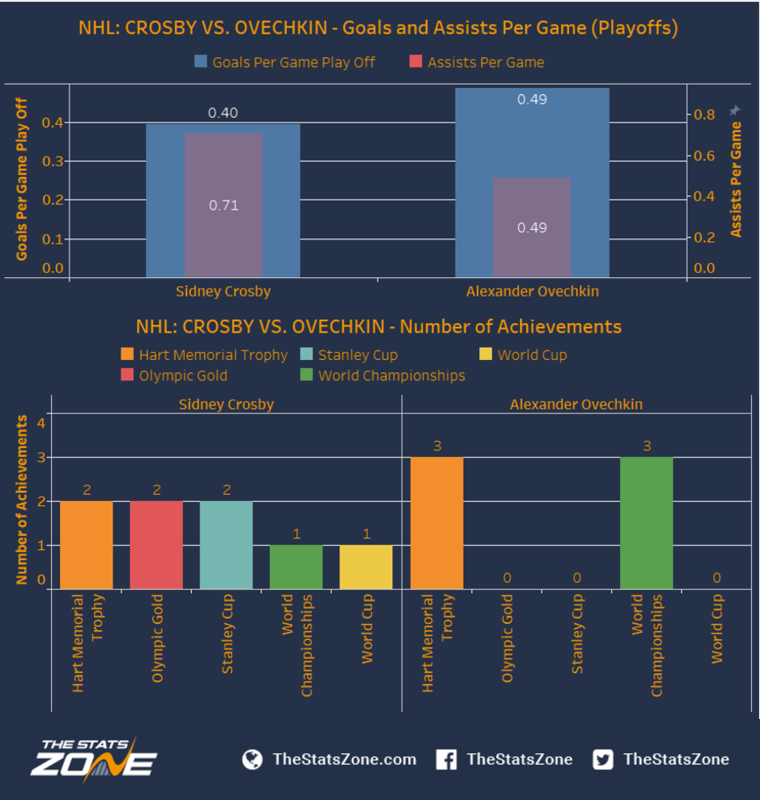 It appears as if Ovechkin scores more important goals than Crosby and in the next two graphs we look into this further to see how each player has performed in the playoffs and how they match each other in terms of career achievements. In the top graph below we can see that Ovechkin has scored 0.09 goals more per game in the playoffs at 0.49 compared to Crosby with an average of 0.40. When looking at assists per game we can see that Crosby gets 0.22 assists more per game at 0.71 compared to Ovechkin with an average of 0.49. Therefore, whilst we know Ovechkin is a better goal scorer and Crosby contributes with more assists, the gap between the two seems to be smaller in the playoffs compared to the regular season (see first and second graph grand total). Moving on to the lower table, we can see that Ovechkin has won three Hart Trophies compared to Crosby at two. In the three most prestigious Ice Hockey tournaments: Olympics, Stanley Cup and World Cup, we can see that Crosby has won the first two twice and the World Cup once. Ovechkin has won the World Championship three times whilst Crosby only won this once. This is partly down to the fact that Ovechkin has played more World Championships than Crosby in the time range of the study. It is worth pointing out that the World Championship is not as significant as the other tournaments as many of the best players are preoccupied with the Stanley Cup (NHL) playoffs, which take place at the same time. From these graphs, it seems that Crosby has performed better within his team, with a stronger record across the main tournaments. However, if we look at trophies won in the Hart Memorial, which celebrates individual players, Ovechkin outperforms Crosby with three trophies vs two. This suggests that as an individual he is a stronger player but may not contribute as much to his team as Crosby. 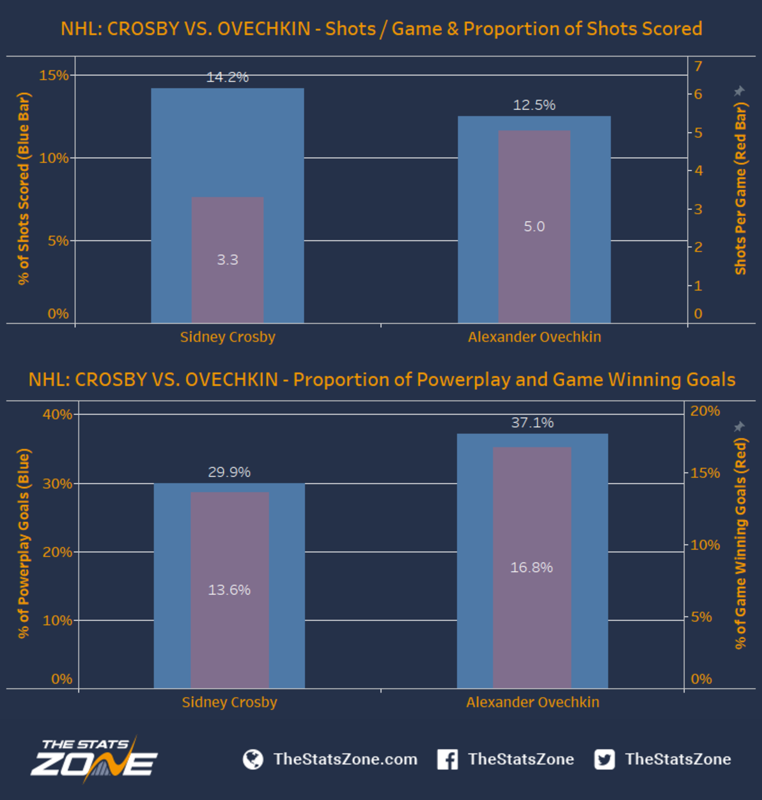 To conclude, we have looked at two of the best current players in the NHL – Sidney Crosby and Alexander Ovechkin. It is difficult to say who has had the most influence as we have found that they play very different roles in influencing the success of their teams. Ovechkin clearly outperforms Crosby on almost every goal-scoring statistic but Crosby contributes more to his team in terms of assists. We have also seen that Crosby delivers a stronger defensive role than Ovechkin, as his plus/minus on average is significantly higher (without a single negative throughout his NHL career). When looking at achievements (tournaments and awards) for each player, it appears that again Crosby has a better team record (having won all of the most prestigious tournaments in ice hockey). However, Ovechkin seems to have stronger recognition for his individual performance. Ultimately, each player seems to contribute differently to their respective team’s performance. But, we suggest that with his stronger defensive attributes and higher achievement records, Crosby outweighs Ovechkin’s individual performance.